Grow your coaching practice by introducing our proven, done-for-you nutrition program... today! Do you find yourself spending too much time creating handouts or resources for your clients and wishing you could have them professionally designed? Or do you simply not have time to create the tools you’d really love to share with your clients? We make it super easy for you to integrate beautifully-designed nutrition programs into your business so you can focus on the thing you do best: supporting your clients to make healthy, life-altering changes. But as a coach, when you pick up a copy of the Clean Eating program, you’ll get complimentary access to the Koso Journal Coaching System. 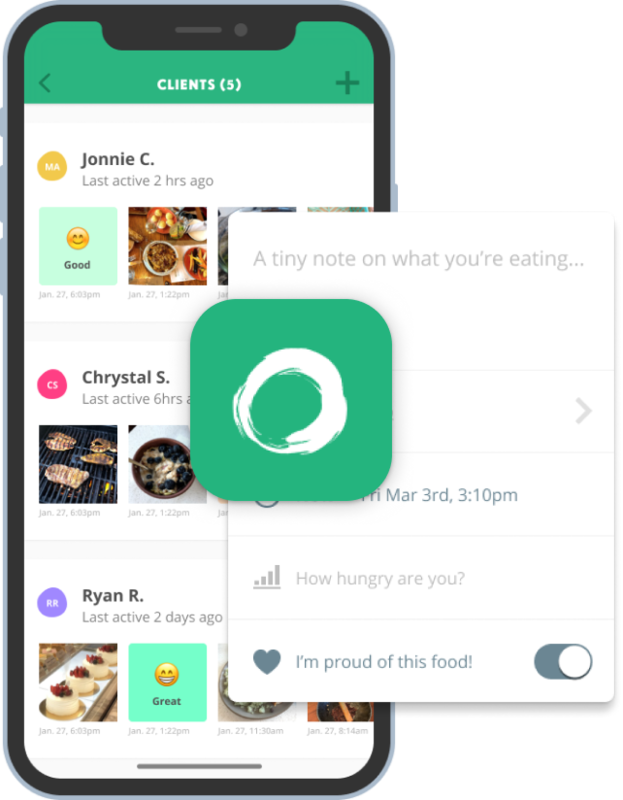 Invite your clients and you can see the food/feelings they log, when they logged it, and how active they’ve been. Watch you client compliance + success grow! This Clean Eating program is great for a short 7-day or 14-day reset. You’ll help your clients feel much better, energized, stronger, and happy. It’s is a fantastic way to show clients the impact of good nutrition. Use the guide as a lead magnet: give it away for free on your website in exchange for an email address. Over time, you’ll be able to convert those email addresses into paying clients. Announce that you’re hosting a challenge, set up a group, and use this program as the foundation for working your group through the challenge. Watch group members come back to you later for other paid engagements. Instead of starting from scratch, use this prgoram as the foundation for your own program. Keto? Low FODMAP? Plant-based Alkaline Reset? Make it yours, and use the info here as a starting point for your writing. Use this program to compliment your other services, from personal training to executive coaching to chiropracting. Layer on nutrition as part of a holistic health plan to give your cleints the best outcomes, and your biz an extra boost. You could invest 100+ hours writing down your nutritional approach, another 50+ hours (an entire week) editing it all down. Then pay a hard-to-find, talented designer for a week @ $50/hr (totaling $2,000) to help you design the layout and graphics, then work with a web developer to figure out how to make it easy to work with online and as a PDF, paying them $75/hr for a week (totalling $3,000) —that’s over $5,000+ and easily 200+ hours of your time! ...Or, you could pay only $98 right now to get all of that immediately—a done-for-you nutrition program crafted by experienced pros. Start offering a nutrition package now.